Published July 12, 2018 at 9:01 a.m.
OK, so it may not get recognized with a Tony Award this year or next, but some of the most enjoyable theater in town this summer isn't happening where you might expect. 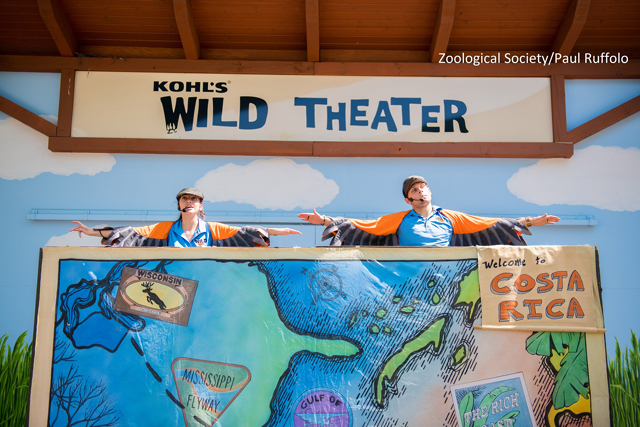 Kohl's Wild Theater, which takes place at the Milwaukee County Zoo, teaches lessons about pets, about internet safety, about migrating birds and more. The performances, which kicked off in late May, run through Labor Day, Monday, Sept. 3 and are free with zoo admission. This summer's four 15-minute plays and musicals take place in the Family Farm area, though you just might see some pop-up performances in other spots around the zoo, including in front of the penguin tank, the big cats building, the bear enclosure and at the new Otter Passage exhibit. 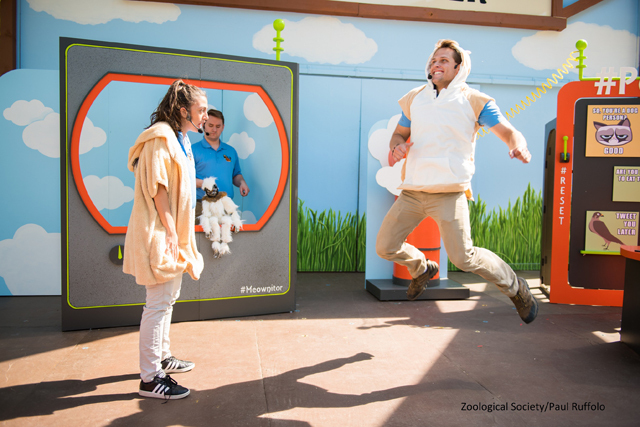 "Our at-exhibit performances are a great way for us to interact with Zoo guests of all ages. We are able to answer questions, perform mini skits and magic tricks, that educate the patrons in a fun and creative way," says Stage Manager and Administrative Assistant Kyle Norris. "One of the most satisfying moments is when you see kids not only understand our message but also wanting to take action. When we see kids want to make a difference, it doesn't get much better than that." New this year is the musical "#PETS!," which stars those YouTube stars Grumpy Cat and Doge. Though you'd think these guys would be more web savvy, Doge considers buying a pet monkey online. But Grumpy Cat – and the audience – help Doge learn to identify the good information and the bad on the internet. 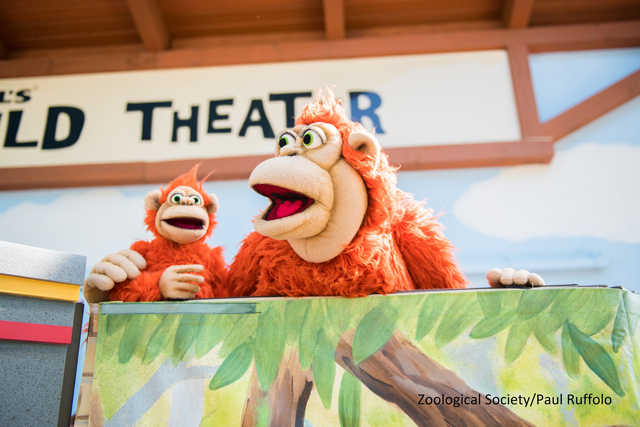 "The Zoological Society and the Zoo get together frequently to discuss important topics for Kohl's Wild Theater to tackle," says Director & Production Stage Manager Reva Fox. "That's when we decided to approach the troubling trend of people buying exotic animals online and making them pets. "Our new summer show #PETS demonstrates to kids and families that just because you see a cute animal in an online video doesn't mean they make good pets." "Journey to the Rich Coast:" Fly along with our migrating birds as they make the journey from Wisconsin to the "Rich Coast." This adventure can be tough, but with your help, they can make the journey that every migratory bird needs to take to survive. "Lights, Camera, Arctic! :" Mysterious circumstances put distant neighbors Ursus the polar bear and Cygnus the trumpeter swan right next door! Audience members join a documentary filmmaker and learn how actions at home can impact animals in the Arctic. "Transportation to Brachiation:" Help clue-finding Kiddo on an adventure to save orangutans in Borneo. Pay close attention because some clues in this 15-minute musical aren't always what they seem, and the future of orangutans may depend on what Kiddo learns about Wisconsin. 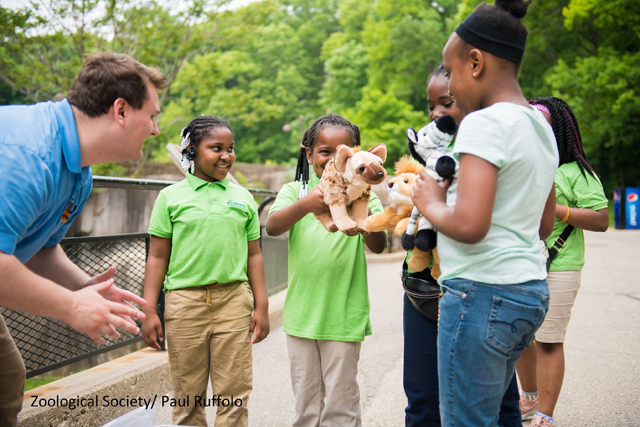 "Kohl's Wild Theater is a great way to teach about conservation, the environment and animals," says Fox. "Kids and families will be entertained as they learn something about the world we live in. "You never know what you're going to get when you see a Kohl's Wild Theater show. From talking puppets to hilarious characters, we have something for everyone." Kids can grab a Playbill stamped at each performance and once they've collected them all they'll win a prize. Outside of the theater, zoo-goers may come across interactive skits and puppets near the penguins, bears, big cat building and new otter exhibit. Kids can get a KWT "playbill" stamp at each show and skit, and kids who fill their playbills receive a prize. Kohl's Cares funds the Wild Theater with proceeds from the sale of books and plush toys in its store. The Wild Theater also visits schools, community events and festivals within an hour's drive of the zoo to perform 30-45-minute shows all year long for free. Learn more at wildtheater.org.